We live in a building that carries the smells of food around it. So many times in the spring and summer, I’ll be cooking, baking, or dehydrating something, and my neighbors will say, “What smells so good?!”. I’ll reply, “Oh, I’m making my love a birthday cake” or “I’m making raw granola”. I say “in the spring and summer” because that’s when I see all of my neighbors. In the winter, none of us particularly like hanging out in the shared backyard in 10 degree weather. We come and go, but we don’t linger. So, I’m assuming that all winter long, too, they can smell delicious aromas of our autumn and winter bounty roasting in the oven or simmering on the stove. My partner may be the most food-nostalgic person I know; there are so many emotional associations between him and food. Sometimes it grosses me out, like when he sees a Wendy’s commercial and wants their food or when he wants a calzone stuffed with enough dairy cheese to feed a village. His tastes have evolved due to an increasing health-conciousness and going vegan, but his emotion + food associations remain strong. What I really admire about him is that he takes a creative approach to quelling these cravings. Maybe it’s all that time he spent working in restaurant kitchens, or maybe it’s that he’s always been good at thinking outside the box, but he understands that just because he’s having a specific craving doesn’t mean he needs that specific thing to satisfy it. There was one time that we made a special trip to Whole Foods to get ingredients for vegan calzones when his calzone craving got out of control, and I’ve written in the past about how an asian dish evoked his nostalgia for ham barbecue. That last one really demonstrates how far out of the box you can be, and it still works! Yesterday, he was in the basement doing laundry, and he smelled something that made him salivate. Someone was cooking roast beef, and it set off his cravings. I feel like sometimes vegans don’t like acknowledging when meat makes them salivate. Our logical brains and compassionate hearts are telling us that a roasted carcass of a beautiful, feeling, loving animal is revolting. So, why the craving? For my partner, it’s almost always emotions. I think that no matter how disgusted by the meat craving you are, it’s so important to address it. Ignoring it could lead a person to cave in to the craving. He allows himself to feel it, and if it’s strong enough, he thinks of a creative way to satisfy it. His solution yesterday was to think of all the other smells that go along with the roast beef. He thought of roasted vegetables and potatoes in broth. You know, meat and potatoes. The classic. We didn’t have any vegetable broth on hand, so I suggested that he use all of the vegetables that are used for broth and it will make it just as fragrant and flavorful. You would’ve never, ever guessed that there was no broth in this because it was so bursting with flavor. 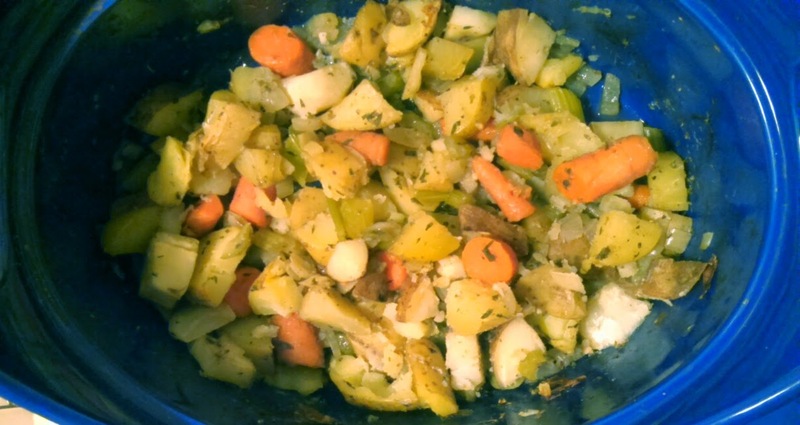 He used potatoes, carrots, onion, and celery and seasoned it with salt, pepper, a bit of olive oil, garlic powder, and fresh thyme. I could eat bowls of just this for days. I live for these simple dishes. He did have vegan sausages in the fridge (which would also help with meat cravings), but instead we served it with quinoa, white beans, and turmeric thyme tahini sauce. So, my advice to you today is to take thoughts of cravings that you are having and look at them from a positive perspective instead of dwelling on the idea that you are suffering in some way. It makes a world of difference, for you and for the animals.